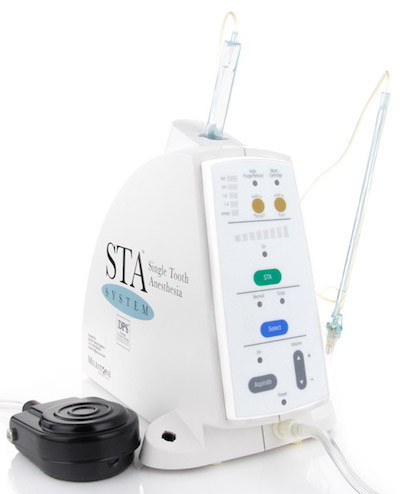 What is the Dental Wand® STA system? Many people who have had a bad experience with injections think that needles sting because the skin is pierced, but this is usually not so. Mostly, the stinging sensation is caused by the anaesthetic being fired in too quickly. Obviously, it is possible for the dentist to control the speed with a standard syringe, but the idea of the Wand is to take out the “human error”. This can be very reassuring for people with previous bad experiences. A lot of people with needle phobia describe the Wand as their “Magic Wand”! As you can see in the photo, the “hardware” looks similar to a miniature computer tower, but curvier. This latest incarnation of the Wand, also called the Wand STA system, has had colourful buttons added to make it look even more appealing. It is even held like a pen! Because of the pen grip, the dentist has excellent control over it, and it is light and easy to handle. To start the computer, the dentist uses a foot pedal (the black thingy in the photo) connected to the computer tower. The computer does the rest. That way, the operator can focus all their attention on holding the handpiece in the right position. The flow rate is also the maximum absorption rate: this means as well as being slow and comfortable, the tooth can get more numb with less anaesthetic. Another nifty thing about the Wand is that it has pressure feedback, so if it meets resistance, it slows down (rather than with the standard technique where some dentists might be tempted to push a little harder). Nowadays, the Wand is equipped with a STA (Single Tooth Anaesthesia) function (hence the name Wand® STA). The STA mode allows the tooth to be numb with minor or at least reduced numbness to surrounding tissues. This is treat if you hate the numb feeling as the lip and tongue are far less or not numb at all. It also has huge advantages for kids, as it reduces the risk of trauma from them accidentally biting their lip while numb. The Wand STA has two modes: the first mode is the traditional wand technique. It now has three speeds so that the delivery can be made faster after the initial slow bit. The second mode is the Single Tooth Anaesthesia (STA) mode which uses a different needle, and has a visual gauge and emits little beeps to let the dentist know when they’ve placed the needle correctly. It can even speak! For example, it will say “cruise” to let the dentist know when they can use cruise control mode. Looks non-threatening and almost cute. Researchers have found that the Wand induces less anxiety than any other injection method (Kudo et al, 2001). The precise control of flow rate and pressure reliably produces a comfortable injection even in potentially more “difficult” areas like the palate, where the tissue is less elastic. 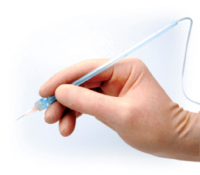 Some “fancy” injection techniques (the AMSA and P-ASA, for the nerds among you) are much more comfortable and effective when the Wand is used. You can numb a single tooth (see “A STA is born” above). Cost! It’s a lot more expensive than using traditional syringes, both for the machine and the disposables. And if you wanted to rely on the Wand alone, you’d have to have a backup Wand in case one breaks down sometime, which means more cost. Because the cartridge holder, tube and handpiece are disposables, there’s a larger volume of hazardous waste (and higher costs for getting rid of the extra waste). Some dentists complain they lose time because it takes longer than their “standard” injection. Takes time (and guinea pigs – usually staff or other dentists) to learn. Takes up extra space. This can be a problem in some rooms, depending on space and layout. A lot of dentists are happy with their painless injection techniques and don’t see the need for it. How can I find a dentist who uses the Wand? The information on this page has been provided by the Dental Fear Central Web Team. Last reviewed by Mike Gow, BDS on October 21, 2018. We welcome your feedback on our information resources.